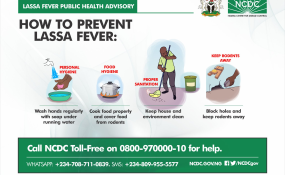 Lassa fever public health advisory. The Nigerian government has been urged to show more commitment in the fight against Lassa fever. Lassa fever is a hemorrhagic disease which has been ravaging the country since it was first discovered in 1969 in a town in Borno State. This year's outbreak, however, happens to be the worst the country has ever experienced, with 394 confirmed cases of the disease and 95 deaths. Speaking on Monday at a high level panel discussion organised in Abuja by the Nigeria Centre for Disease Control on the state of Lassa fever in Nigeria, Oyewale Tomori, a professor of Virology, said it is sad that Nigeria is yet to find a lasting solution to Lassa fever 49 years after it was first discovered. Mr Tomori said Nigeria has been taking same action on the disease without combating it. He said until Nigeria takes ownership of the disease and finds a lasting solution, there will be no breakthrough because the disease has come to stay. Corruption, Mr Tomori said, has been a major factor hindering progress in the health sector and fight against many diseases ravaging the country. He lamented that the country was meant to have two Lassa fever specialised facilities, one in Irrua, Edo State and the other in Maiduguri, Borno State. Unfortunately, only one is existing despite money being released for both, he said. "The Irrua Specialist Centre in Edo was not the only facility meant to specialise in treating Lassa fever cases. Money was released for two centres, Irrua and another to be established in Maiduguri. The one in Maiduguri is nowhere to be found. Patients are not meant to be referred from the North to Irrua. It is wrong," he said. Mr Tomori also said Nigeria needs to stop depending on foreign donors and partners who have been championing the nation's health campaigns. "We need to do more, what the senators are getting is enough to do many things in the health sector. It is not that we don't have the resources, we do. It is corruption and good governance we should be talking about. If the government takes responsibility we won't be here discussing Lassa fever. "Nigeria has an ability of making its experts novice. If something is not done about it, the situation will be worse," he added. Though NCDC said this year's Lassa fever outbreak is slowing down, three states Edo, Ondo and Ebonyi were tagged hotspots. Elsie Ilori, Incident Manager, National Lassa Fever Emergency Operation Centre at NCDC, said the country was prepared for outbreak but not of this magnitude. She said the magnitude of this year's outbreak took the country unaware. Ms Ilori said NCDC and the development partners are having a head way in containing the disease. She however lamented lack of responses from most state government in tackling disease outbreak. She said one of the reasons why the country witnessed an outbreak of such magnitude was because most states did nothing to respond to the situation in spite of the alerts. "There is no way we can say we were not expecting an outbreak of Lassa fever. It has become seasonal. We already developed guidelines, have supplies and medicine to combat the outbreak but most states are not informing us of their situation. NCDC had to move into Kogi and Plateau states based on our data collection. They did not inform us they have problems," she said. Ms Ilori said states need to start participating in emergency disease control and response and not always wait for the federal government for interventions. "There is a lot of pressure on the Federal Government. States should start taking responsibility for their citizens. We have been doing contact tracing because we have WHO and development partners on ground. "Most of the states are not involved and this is a huge issue. We need to follow up a contact for 21 days. If we don't and the contact comes down with the disease, it can continue spreading," she added.